Breast pain is a common symptom that can develop in connection to a woman's hormone cycle. During menopause, when a woman's hormonal levels become imbalanced, the likelihood of breast discomfort increases. While postmenopausal women can experience breast pain, it is most common in premenopausal and perimenopausal women. Breast pain is a common symptom, affecting as many as 70% of women at some point in their lives. Only a small portion of these women - about 10% - will experience severe breast pain, which can negatively impact daily life. While breast pain can be concerning, it rarely signals breast cancer. Most cases of breast symptoms in menopausal women are caused by normal hormonal changes in the body. Better understanding breast pain in menopause is one of the best steps towards managing this symptom. 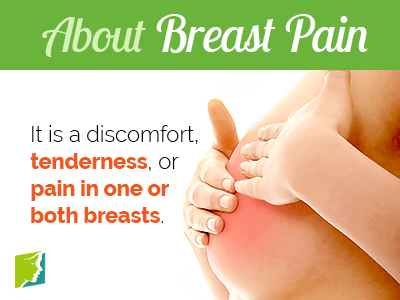 Please read on to learn more about breast pain. Breast pain - known medically as mastalgia, mastodynia, or mammalgia - is the general term used to mean discomfort, tenderness, or pain in one or both of the breasts. Many women experience breast pain around the time of menstruation or during pregnancy, when the hormones estrogen, testosterone, and progesterone are in flux. As with menstruation and pregnancy, menopause is also a time of hormonal fluctuations, which means breast tenderness and pain may appear. Breast pain can occur at any point in life and varies based on a woman's own unique physiology and genetics. However, there are common symptoms of breast pain that occur. Please read on to learn more about these symptoms. Please read on to learn more about the different types of breast pain that can occur during a woman's life. There are three main types of breast pain, with most cases of breast pain classified as either cyclic or non-cyclic. However, in some cases, breast discomfort can be classified as extramammary, because the origin of the pain is outside of the breast itself. Cyclic breast pain is most closely related to the menstrual cycle and changing levels of hormones. This is the type of breast pain most commonly experienced by premenstrual women and perimenopausal women in their 40s. Non-cyclic breast pain is unrelated to the hormonal fluctuations of the menstrual cycle. This type is more common in postmenopausal women. Extramammary pain is discomfort that originates from an area other than the breast. For example, a pulled muscle in the chest can cause breast pain. While some women describe their symptoms as breast pain, many others report feeling breast tenderness during menopause. Even though the distinction between tenderness and pain is subjective, breast tenderness is often described as mild to moderate discomfort and sensitivity to touch while pain is more intense or localized. Click here to learn more about breast tenderness during menopause. Now that the symptoms and types of breast pain are better understood, the next step is learning more about the causes of breast pain during menopause. Breast pain that is a consequence of muscular damage is categorized as extra-mammary pain, meaning the pain in the breast actually originates from an outside area; in this case the pectoralis major muscle. It can also be referred to as "chest wall pain", because often causes pain in the chest wall or rib cage too. How Do I Know If My Breast Pain Is a Sign of Menopause? Breast pain and menopause can often go hand in hand, but it can be difficult to distinguish if the pain has anything to do with menopause, or whether it is due to something else entirely. This article lists some telltale signs that suggest your breast pain might be linked to menopause. Breast pain in young women is primarily cyclical - caused by hormone fluctuations during menstruation. Pain can range from mild to severe. Exercising regularly, eating healthy, and trying at home remedies are among the helpful ways to prevent and reduce breast pain. Keep reading to learn more.